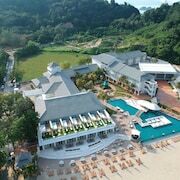 Nestled on the beach, this Kuah resort is within 2 mi (3 km) of Kuah Jetty, Langkawi Terminal Ferry, and Eagle Square. Night Market is 2.1 mi (3.4 km) away. 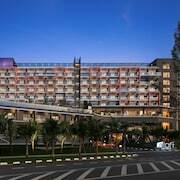 Situated in Langkawi, this hotel is within 2 mi (3 km) of Tengah Beach, Pantai Cenang Beach, and Underwater World. Cenang Mall is 1.4 mi (2.3 km) away. 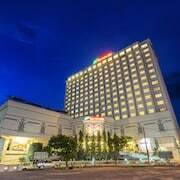 Situated in Langkawi, this hotel is steps from Cenang Mall and Pantai Cenang Beach. Underwater World and Tengah Beach are also within 2 mi (3 km). Feel like sunning yourself on beautiful white sandy beaches? In that case, make a dash to Malaysia’s lovely Langkawi. Made up of 99 islands, you’ll quickly see why this archipelago is called "The Jewel of Kedah"! 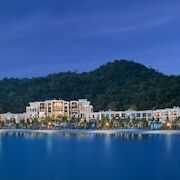 Check out our Langkawi hotels and feel the sand squishing between your toes! Several different groups have ruled Langkawi over the years, including the Siamese, British, and Japanese. A quiet and peaceful group of islands, the area became tax-free in 1987 with the aim of encouraging tourism and generating more business for the local communities. In 2007 it was given Geopark status by UNESO. Today Langkawi is a very popular holiday destination and traces from other cultures and influences can still be seen. The soft white sandy beaches are a huge crowd pleaser and you can easily spend many delicious days lazing in the sun and beach-bumming it. Pantai Cenang is the most popular beach, although you’ll find many more across the different islands. The waterfalls at Pantai Kok add something extra-special to your time at the seaside and the karsts, caves, and mangroves of Tanjung Rhu allow you to combine nature and relaxation on the sands. Bird lovers should check out Pasir Tengkorak. The mountainous interior provides loads of opportunities for scenic hiking and there is a great lookout point at the top of Gunung Raya, the tallest mountain in Langkawi. Trekking in the jungle is a favourite activity. Ride the cable car for even more amazing island and ocean views, and go snorkelling to see a wide array of aquatic life. Fun for all is available at Underwater World and crocodile Adventureland and the Oriental Village is a top place to learn more about the local traditions and ways of life. Learn about the myths and legends surrounding the spectacular Telaga Tujuh Waterfalls, take a stroll through a rice garden, and check out the local museums. As a tax free area you really can find some excellent bargains! Some of the best places for shopping can be found at Cenang Mall, Langkawi Parade Mall, and Kompleks Budaya Kraf. Fresh seafood is high on the local menus, and there are many restaurants to choose between. Foodies will love the assortment of cheap and tasty street eats. With no real public transport, your best options for exploring are to hire a scooter or car. Lots of tours are available though if you don’t feel like driving yourself. 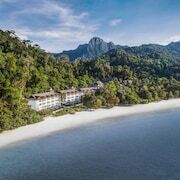 As well as excellent Langkawi accommodation, make sure you don’t miss our incredible deals on flights to Langkawi. Save big and live every last minute!